Atletico Madrid failed to halt their run of successive defeats at the Vicente Calderon and were left to rue a Diego Forlan missed penalty. Los Che scrapped hard for the 1-2 victory which moved the visitors into third in La Liga. The loss all but shatters Atleti's hope of reaching fourth place for another season. Valencia battled hard without the likes of Juan Mata, injured, and Ever Banega out suspended and gradually grew in the game without ever really testing David De Gea in Atleti's goal but they made the most of the few chances they had. Los Colchoneros took an early lead through a persistent and clinical Jose Antonio Reyes but despite dominanting the first-half for long periods found themselves going into the break on level terms, as Joaquin made the most of defensive lapses. Late in the second-half the Valencia captain ruined another evening this year for Atletico by placing a low shot beyond De Gea for the three points. Madrid finished the night with ten men, as Diego Godin was shown a straight red card for a high elbow. A scrappy start by both clubs in the Spanish capital was quickly put to rest by the home side, Diego Forlan collected the ball wide on the left for Atletico Madrid and squared a nice ball into Jose Antonio Reyes; with only a few minutes on the clock the winger danced through two casual tackles and buried his shot into the far corner. Quique Sanchez Flores' men settled down nicely after scoring and controlled the game in terms of territory but passing from both was sloppy. Valencia continued to lack shape despite some nice work from Roberto Soldado on the right wing, but the striker watched his dangerous cross just cleared out. Clear cut chances were failing to materialise for a dominant Rojiblancos, captain Antonio Lopez twice in the thick of things. The left-back first claimed for a penalty as he poked the ball round Joaquin but there was neither contact on the ball or the player. Lopez then watched his rather tame free-kick deflect off the wall and fortunately for Valencia the ball went behind for a corner. Valencia thought they had finally cut open Atleti five minutes before the break when a wonderful pass from Tino Costa split full-back and centre-back but Jordi Alba had just strayed offside. Los Che only had to wait a matter of seconds beofre they were infact level. Pablo Hernandez picked out Alba in space on the left and his low cross was missed by everyone near post, allowing Joaquin to tuck home his third of the season. Atletico had more to worry about going into half-time with an injury to goalscorer Reyes. The winger was clipped by Hedwiges Maduro and tried to spin out the tackle, but landed awkwardly on his back. The hosts made a bright start but couldn't force the early goal in the second period like they had done in the first, Tiago's drive finding a wall of orange shirts to deny the Portuguese midfielder. Los Che were just getting themselves back in the game when Maduro brought down Reyes with a crunching tackle in the box to concede a penalty. However, the visitors had luck on their side as Diego Forlan could only drive his spot-kick back off the post. Aguero looked like he was going to break his 2011 duck with a turn of speed Valencia couldn't keep tabs with but the Argentine's shot was smothered by Vicente Guaita. The game was becoming end to end as both sides went for the kill. Pablo Hernandez fed Jordi Alba on the overlap but the wing-back could only hit the side netting with his shot. It was the same result at the other end when a poor clearance dropped kindly for Reyes, but his volley was palmed round the post. Frustrations could be heard all round the ground from the home fans making their voices heard with every missed opportunity and Atletico were made to pay late on. Mehmet Topal's burst down the left caught the hosts out at the back, and his pull-back was perfectly placed into the corner by Joaquin for his second of the night. It went from bad to worse for the red and whites, Diego Godin being harshly sent-off leading with an elbow on Joaquin. The defender kept his eyes on the flight of the ball going up for the header but the referee saw intent in the challenge and Sanchez Flores looked a disturbed man in the dugout. The loss keeps Atletico in 8th place in the table, while Valencia leapfrog Villarreal into third temporarily. Atlético (1): De Gea, Valera, Antonio López, Tiago, Forlán, Raúl García (Mario Suarez, min. 82), Agüero, Fran Mérida (Juanfran, min. 61), Godín, Reyes y Perea. 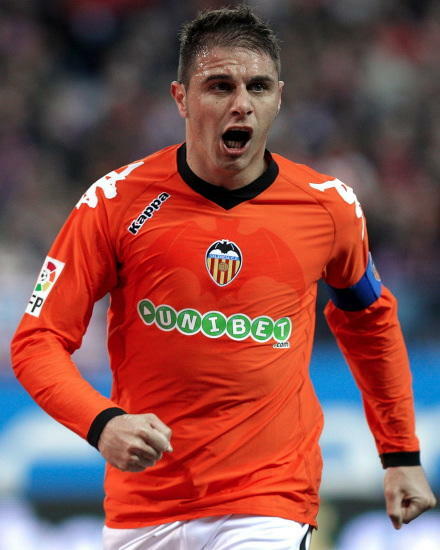 Valencia CF (2): Guaita, Bruno (Miguel, min. 74), Maduro (Navarro, min. 78), Topal, Joaquín, Soldado (Aduriz, min. 63), Stankevicius, Pablo H., Ricardo Costa, Tino Costa y Jordi Alba. Goals: 2nd min. 1-0 Reyes; 40th min. 1-1 Joaquín; 85th min 1-2 Joaquín. Guaita 7 - Several good saves, looked confident through the match. Bruno 5.5 - Good defensively, did not go forward and was more comfortable sitting in defense. Stankevicious 6 - Decent showing, did not make any bad mistakes and was largely good in defense. Maduro 5 - Probably the worst player on the pitch. Almost gifted Atletico a second goal with his penalty give away. R. Costa 5 - Beaten once, but it counted. Other than that it was a decent match. Alba 6 - Went forward a lot more than Bruno, has few shots on goal and one good cross that found Joaqin. Was in the middle of the mess for the first goal and that counts as negative. Joaquin 8 - Scored the two goals and certainly best player, along with Pablo. Some ruined dribbles, but provided when important. Topal 6 - Not too influential with so many defenders and didn't link-up good with Tino Costa. He several interceptions, but nothing stand out. Tino Costa 6.5 - Bonus point for running without stopping and having that killer pass. Not very influential in the midfield and of course could not manage possession. Pablo 7.5 - The most creative player in the field, provided 1 assist and created the chance that lead to the first goal. Soldado 6 - Good when going on the wing, but unlucky that he was the striker, the one that should be in the penalty area and had no one to play with. Aduriz 5.5 - Probably did not have enough time, but did nothing more than what Soldado already did. Miguel N/A - He had 2 sloppy passes, but not enough time overall to judge him. Navarro N/A - Made one crucial interception, but again not enough time to form a mark. NOTE: Did a small score update, increased alba's score by 0.5 and reduced soldado score by 0.5, this is after seeing the match again.